Hand weaving takes me on journeys of delight from the initial design idea to a tactile finish. Weaving on simple frames I make large hangings and smaller framed pieces to celebrate the joy I find in the natural world. 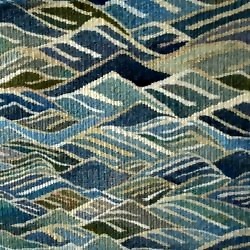 Within warp and weft, this slow medium allows room for intricate detail exploring pattern and form and gives a true sense of mindfulness in a world of speed. I welcome visitors to my studio/gallery to see work in progress as well as what hangs on the wall. do contact if you are interested in either visiting, booking a workshop or to discuss a commission.